Doto is a young god who usually looks like a humanoid leopard; the son of Kwaee, king of the gods, who looks like a humanoid leopard with a feathery crest. But Kwaee has become irascible and sullen to all life, mortal and the other gods alike. He has withdrawn from the forest to sulk upon his throne. Doto learns that the uneasiness is caused by the return to the forest of Ogya, the powerful god of fire and destruction, with his acolytes, the Fire Bearers. 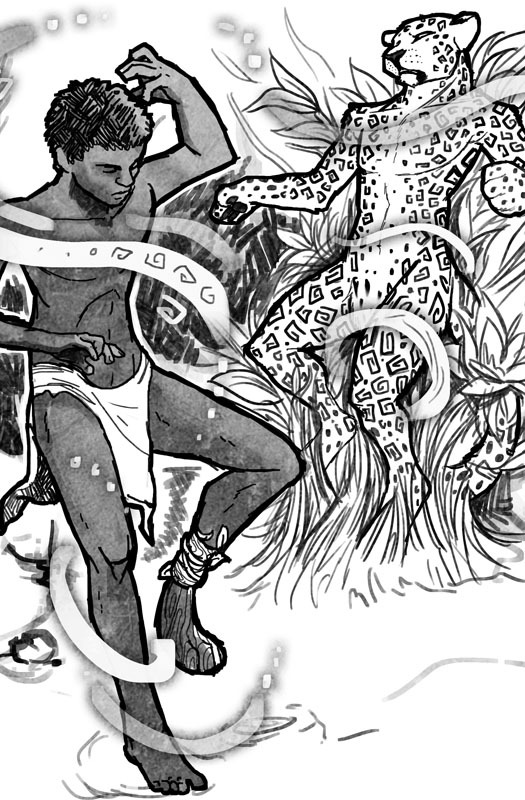 Doto races to his father to report the dread news, so that Kwaee will finally rouse himself and deal with the menace. Instead, Kwaee belittles him for bothering him with imaginary fears. He orders Doto to go and capture a Fire Bearer, if they are real. The Fire Bearers are, of course, humans, who have migrated across the savannah and come to the forest. The presence of baboons, grey parrots, gorillas, hyenas, and elephants clearly establish this as ancient Africa. Clay and Laughing Dog’s tribe has been driven to the edge of the forest by the increasing desertification of the sahel and savannah. (The development and spread of the Sahara Desert?) The tribe’s ancient legends of the forbidden forest keep them from venturing into the forest. But Laughing Dog’s disbelief in the gods leads him to publicly break the taboos. Laughing Dog’s iconoclasm results in his exile from the tribe, and Clay’s unexpected vulnerability to the prowling Doto. God of Clay splits into two stories told in mostly alternating chapters; those of Clay being led south as Doto’s captive, further into the forbidden forest-jungle; and of Laughing Dog, who ventures alone north, back into their tribe’s ancestral lands to learn what has become of the savannah-turned-desert. Their adventure become a learning experience for all three, each discovering that the nature of the world, of life and of the gods, is not what he was brought up to believe. Were their elders mistaken? Or lying to them? Or is the nature of things changing and evolving? Do the gods control the world, or does the world control them despite their power and arrogance? 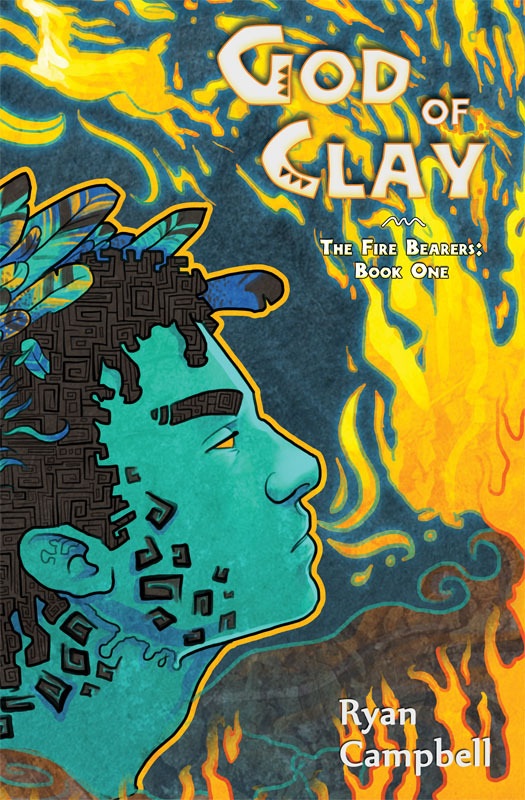 Clay denies that humans are controlled by Ogya, the god of fire, but he has to admit that Ogya is one of gods whom the tribe worships, and humans are the only animals that have fire. Is Ogya “a benevolent trickster [or] a malevolent, world-consuming monster”? (p. 123) Is he manipulating humans without their awareness? And are humans just another species of animal, or something different? He [Doto] twitched his ears backward towards the sounds of thousands of tiny feet moving over the loam. His fur lifted and stood on end with the familiar energy in the air that told him a god was nearby – a lesser god, perhaps, but a god nonetheless. Behind him, a parade of ants was approaching, winding their way around roots and fallen leaves. Carrying assorted bits of food and earth. A very large ant led them, his head half as high as Doto’s knee, and he walked upright, in the manner of the gods. He was munching a pear, his mandibles clicking in a rhythmic pattern. He wore an expression of deep focus, but looked up when Doto’s shadow fell over him. ‘Brother Doto.’ He grinned between bites of fruit. He did not stop marching forward, nor did his subjects stop moving behind him. 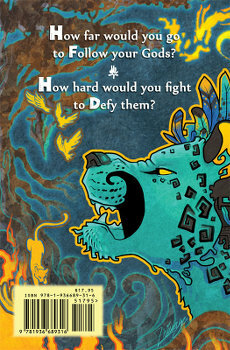 The Fire Bearers: Book One is not just a learning experience for the three. Each is subtly, physically changed, for better or ill. To say how, or to where God of Clay leads, would give away too many spoilers. Just know that, despite what each of them goes through, their unexpected journeys have just begun. And that the reader is left, frustrated, anxiously awaiting Book Two. God of Clay, which debuted at RainFurrest 2013, has a wraparound cover and ten illustrations by Zhivago. P.S. 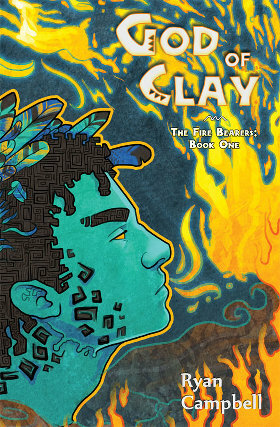 Flayrah's delay in posting this review has enabled me to announce that God of Clay is the winner of the Furry Writers' Guild's Cóyotl Award for the Best Novel of 2013, as announced at an awards ceremony at RainFurrest 2014 in Seattle on September 26. This is tagged 'opinion,' but there's no opinion here besides maybe looking forward to a sequel. Where's the review? It's really, really well-written, with lots of clever surprises that kept me reading through it and resenting any interruptions. I am eagerly awaiting Book 2 of The Fire Bearers.